This is a essentially a blog devoted to Raghavendra Swamy, Mantralaya, his previous avatars as Prahalada and Vyasa Theertha, their works and miracles. Sometimes, this post may also feature articles on other Madhwa saints and sites associated with Rayaru. I am the devotee of Sri Rayaru. I can able to get more information and miracles of Rayaru through ur blog. I am thankfull for ur great service. I have a question to u, i hope u will guide me since u offer regular prayers to rayaru. What is the procedure for worshiping Rayaru in our daily routine (both morning and evening time). Rayaru wants devotion and sincerity. All you have to do is place a photo of Rayaru in your pooja room and light a lamp every morning and evening. You can recite Poojyaya Raghavendraya…..as many times as you want. Then do pradakshina. On Thursdays, please try to visit a Raghavendra Swamy matha if it is nearby. In case you want to know any slokas of Rayaru, there are plenty of books available. Recite them at least once a day. Of course, it goes without saying that you have to have a bath in the morning and then commence your pooja. In the evening, wash your hands and feet and wear fresh clothes and offer prayers. 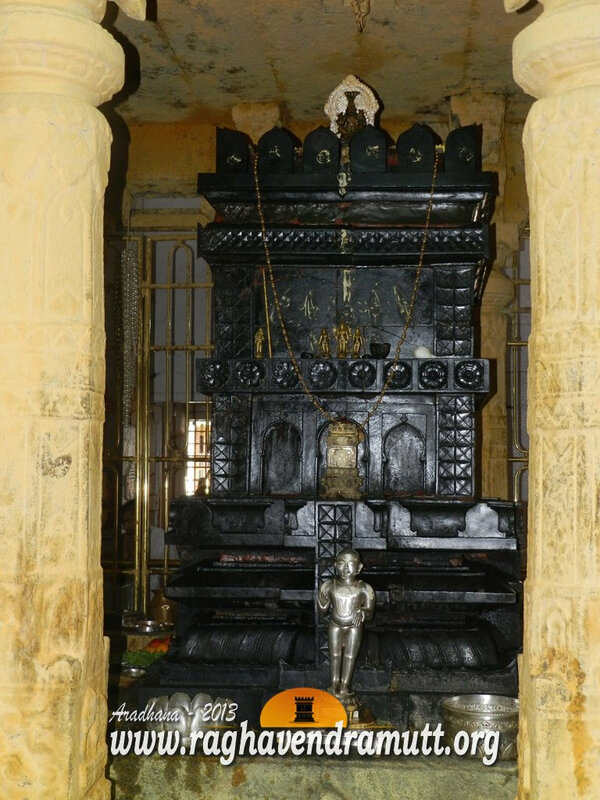 In case you need more details on how to specifically worship Rayaru, kindly refer to Raghavendra Tantra by Krishna Avadoota wherein he has given extensive information on how to pary to Raghavendra Swamy. The book was inspired by Rayaru himself who gave the alphabets to Krishna Avadoota to commence writing the book. There is no problem that Rayaru cannot solve. All you need is devotion and sincerity. Rayaru never believed in the caste system. There are enough anecdotes to testify to this. However, this does not mean that he did not believe in his God. His God was Hari and Rayaru worshipped Hari, while at the same time, he respected other religions. Please remember that he built his Brindavana on a piece of land that had already been gifted to a Sufi saint. Siddi Masud Khan took back the gift and gave it to Rayaru. He also contributed to the construction of the Brindavana. Do a simple seve to Rayaru. Where do you want to do it. At home or at temple. Give us a few more details so that we can help you. Wishing you the best in life. can u please give me your personal email id so that I can mail you my problem and want to know what kind of seve to do. Please don’t publish this comment. it has my email id. You can write to our inhouse contributor/expert at sudharam89@yahoo.co.in. Please feel free to write about anything that is bothering you. I hope your problem would be easily solved. We got married four years back. We don’t have children yet. I’m a devotee of Rayara. Do you suggest any special seva to have a children. Visited so many hospitals till now, but no result. Today is the first of the three day Raghavendra Aradhane. These three days see a huge rush of devotees to Raghavendra Swamy temples all over the world. You will find details about Hindu Festivals, Slokas, Prayers, Vegetarian cooking and much more useful information.